The Policy Manager Scripting API, located in the \docs\scriptDocs folder of the Policy Manager installation folder, provides a series of interfaces and classes you can use to build process-related scripts. The API includes lots of use cases and sample code you can experiment with and use as a baseline when building your own custom quota management scripts. You can also access the API on the Akana Documentation Repository: Policy Manager Scripting API. Name: A read-only field that displays the name of the Script Policy. Description: A read-only field that displays the description of the Script Policy. Test Script: A button that allows you to test the entered expression to determine if it is properly formed. This option is available in Policy Manager version 7.x only. 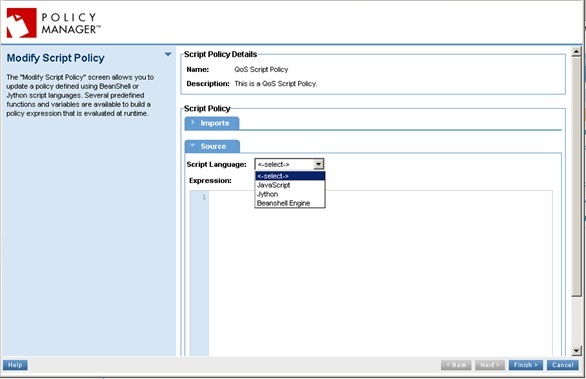 Let's take a quick walkthrough of the Script Policy configuration process to get you started. 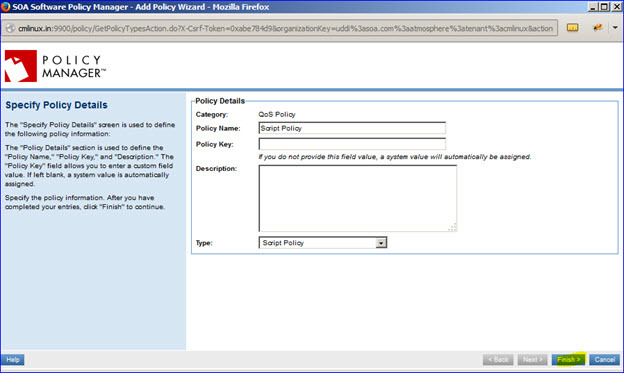 In Policy Manager, you can create a Script Policy instance using Add Policy in the Policies > QoS Policies section. Select the script language from the drop-down list box, and then enter your script into the Expression text box. Click Finish to add your script, and then click Close to exit the wizard. 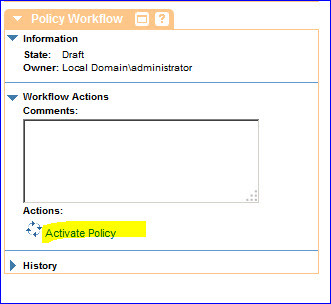 Activate the policy in the Policy Workflow Portlet. After you've saved your policy, attach it to a web service operation. To test the policy, send a request and view the Alerts portlet in the Registry of the Organization Tree. An alert is generated for each request sent. For a walkthrough on how to use scripts and access to the Policy Manager Scripting API for each Policy Manager version, see Getting Started with Scripts. This section provides a list of Community Manager-specific usage scenarios for the Script Policy. How Do I Verify Script Policy at the Service Level? How Do I Verify Script Policy at the Contract Level? How Do I Verify Script Policy at the License > Term Level? Note: If you are using a Script Policy with Community Manager, you must first add the policy to the Community Manager Tenant Organization in Policy Manager. Once that's done, it will be available for selection in the developer portal. 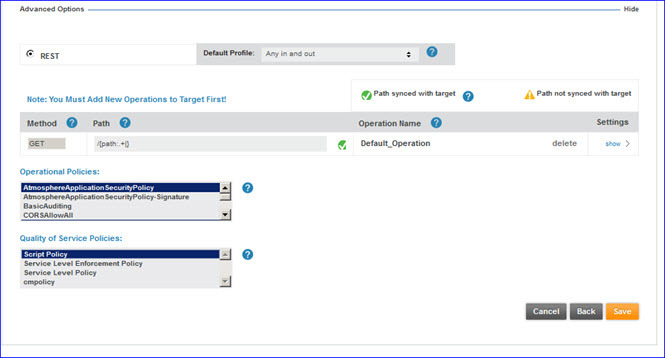 Go to the Policy Manager Management Console > Tenant Organization > Policies > QoS Policies and choose Add Policy. Specify Policy Name, Policy Type (Script Policy), click Finish, and then click Close. 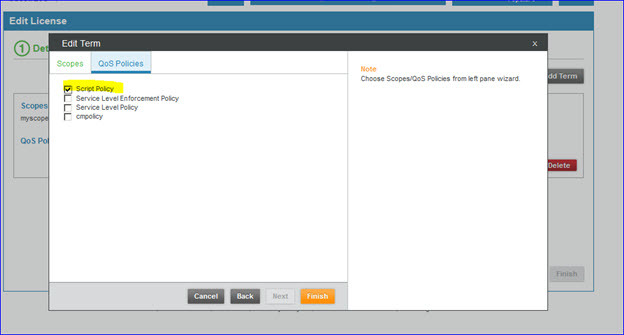 On the Script Policy Details screen, click Modify. 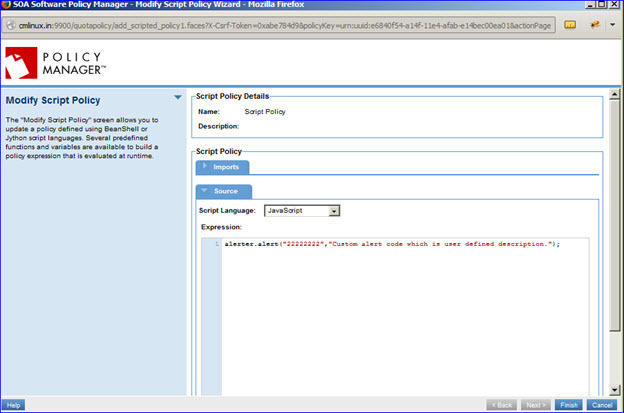 Attach the Script Policy at the Service Level as shown below in the Edit API Wizard > Proxy section. Now send requests from the app in Test Client. An alert is generated for each request. You can see these alerts in Policy Manager > Registry level. While requesting API Access, select the Script Policy checkbox and finish the process. Make sure the contract is activated. Send a request from the app in Test Client. The request should be successful and you will see the following alert type for each request. Choose Edit License and attach the Script Policy. Select the scope that is used with your license. Request API access and select the same license. Go to Test Client and send a request. You'll see an alert in Policy Manager for each request.